Instead of over-using your hand and wrist, your arm will most of the time let the optical Handshoe Mouse float without any effort. The shape allows for the hand to continuously rest on the mouse body in a relaxed fashion, so there is no skin contact between your hand and the desk. 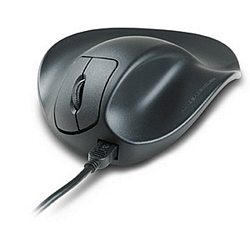 As a result, there is no skin irritation as caused by excessive rubbing when moving a conventional mouse. Contrary to conventional computer mice you don't have to continuously lift (hover) the fingers, to prevent accidental switching. NEW!! The new Light Click version of the Handshoe mouse answers Handshow users calls for the need for a device which requires minimal effort, less muscle and nerve pinching and increased comfort. The Handshoe Light Click mouse conveniently comes in three sizes to meet your individual comfort need. 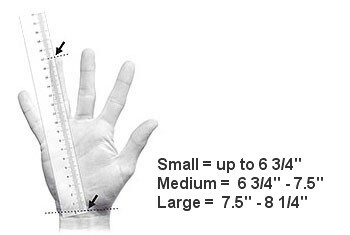 The measuring chart will assist you in choosing your correct size. **These items are on clearance and guaranteed to work when you get them and carry the manufacturer's warranty. No returns or exchanges. The packages may have been opened.